Kells and Connor YFC have had a successful year in 2016 and things will only get better in 2017. The club have enjoyed many fun filled meetings including ice skating, a roving supper and bubble football and are excited about what meetings this new year will bring including Airsoft, an exchange night with Crumlin YFC and a trip to the Eddie Irvine Centre. The club have taken part in and been placed in lots of different competitions so far this club year. This included club member Rachel Barr being placed first in the over 18 group in the Floral Art Heats, Andrew White, Alex Wylie and Timothy Hodge being placed first in the novice fencing competition and Amanda Hamilton, Anna Mawhinney, Rachel Barr, Clare Mawhinney and Laura Surgenor being placed first in the senior section of the 2016 county quiz. As well as club meetings and competitions the club have held two fundraisers and a children’s Christmas party for family and friends to take part in. The club has greatly appreciated all of the support from their ‘Are EWE being served’ fundraiser and their annual Christmas coffee morning. 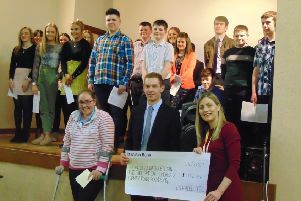 Money raised by the fundraisers was put into club funds along with £150 being donated to the Community Rescue Service, Portglenone. If you wish to find out more information about the club visit the Facebook page or contact: Club leader, Davy Graham on 07749001374 or club secretary Rachel Barr on 07860225357.